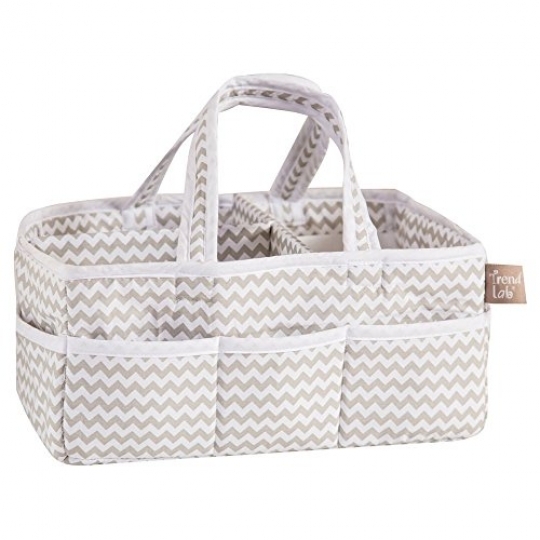 The Trend Lab Dove Gray Chevron Storage Caddy makes staying organized easy. Extremely versatile with its eight outer pockets and removable T-separator, this caddy can be used for bath time, craft supplies, picnics, traveling, toys, and more! Its dove gray and white chevron print looks beautiful with any decor making it the perfect addition to your baby's nursery. Formed in 2001 in Minnesota, Trend Lab is a privately held company proudly owned by women. Rapid growth in the past five years has put Trend Lab products on the shelves of major retailers, and the company continues to develop thoroughly tested, high-quality baby and children's bedding, decor, and other items. Trend Lab continues to inspire and provide its customers with stylish products for little ones. From bedding to cribs and everything in between, Trend Lab is the right choice for your children. Dimensions: 12W x 8D x 6H in.. Dove gray and white chevron print. Coordinating white trim. 8 outer pockets and removable T separator. Made from cotton.